We missed the game reviews against Boston and San Jose due to busy/conflicting schedules (apologies on behalf of MLHS), but in the spirit of “better late than never,” let’s tuck into some observations about the two home wins as we stare at the countdown clock waiting for news on William Nylander. For those that haven’t seen, you can spend the next 24+ hours staring at a live clock that’s counting down towards the December 1st 5 p.m. EST deadline at the bottom of the MLHS sidebar to your right. There’s just something about the self-belief and the air of confidence of Auston Matthews. He’s got a yearning to be the best and an ability to perform in big moments that makes it almost a certainty, in games like the San Jose win, that he is going to score and probably have a multi-point night. Those are high standards for any of the elite players in the league. To have that sense of occasion and ability to deliver in such a fashion — against a really good San Jose Sharks team (albeit in the second half of a back to back) — are things you expect from Sidney Crosby and Alex Ovechkin. Matthews is, without a doubt, in that stratosphere. It took him only 3:38 into the first period to assist on a pretty power play goal in his first game back from injury. Rielly to Marner to Matthews to Tavares… it all felt very familiar. That almost automatic power play didn’t seem to miss a beat against San Jose’s top-ranked penalty kill. That juggernaut power play from the first month of the season had gone ice cold over the last stretch since Matthews had been out. Before the power play goal in Boston, the Leafs hadn’t scored a power play goal since they scored three on November 13th against the lowly Kings. Matthews’ (and, lest we forget, Nylander’s) ability catch a puck on his correct hand, across his body, and get it off the stick in such a blindingly quick fashion is unique even among the league’s superstars, and it makes the Leafs‘ powerplay very difficult to defend. Elliotte Friedman mentioned at intermission about how special it is that Matthews does it from his strong side with a wrist shot while standing still on some of his power play goals. Contrast that with the style of players like Ovechkin, Stamkos and Laine — they are doing it on their off wing as a one-time slapper, which can lack the precision playing on your correct side using a wrist shot offers. Even John Tavares, who is an obviously brilliant player, doesn’t have just that ability to do it just so as Matthews can. Tavares plays with an extremely stiff stick (a 105 flex) and it — somewhat — limits his ability to generate torque in his shot without a full, classic wind-up. The stiffer the flex, the harder you have to lean into it, and therefore, the longer it takes to release. The across-the-body pass that Matthews can receive and rip in one motion is down to his pure, soft hands, talent, power and technique, but it also helps that he plays a very whippy, flexible stick (an 82 flex). As a bigger and rangier player, the effect is amplified and there is very little wasted motion. That pass across to him is going to be ripped top shelf or sent into the slot as a pass with the exact same motion, which is really hard to read for the penalty killers and the goalies alike. This was the now-classic Matthews dagger. Standing still, top of the circles, bar down. Everyone knew he was going there. He stared the goalie down and did it anyway. Penalty killing units have started to ignore Marner’s shot on the power play — something we predicted would come — and are focusing on taking away his fake-shot/pass cross-ice (or to the high slot or net front). That was easier to get away with without all of the different threats that are opened up with Matthews on the ice. You can see on the first goal that the Sharks over committed on Marner and they got burned immediately. 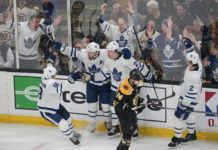 A growing worry from media and fans early in the season was about the team’s inability to win enough at home, which was more than a little premature considering the Leafs set a 100-year franchise record for home wins last season. It’s also worth noting that Mike Babcock’s Detroit teams usually had excellent home records (relative to the talent on the team and the road record). There was some noise building across social media about Babcock over-thinking and over-coaching with match-ups this year, but that’s now the sixth win in a row at home for the Leafs, including a nice win with Matthews back in the lineup. The Leafs are now 9-5-0 at home and 9-3-0 on the road. It was a small-sample oddity that was bound to correct itself over time. The Leafs’ systems are more active and require a more collective effort from the five-man group than a lot of teams in the league. When it works, this is a classic Babcock-coached team: Relentless, skilled, and detailed. Fair dues to the head coach, who has them playing a rewarding style. When will meets skill, it’s usually a good omen for any hockey team. Right now, the Leafs are playing at a breakneck pace when they are really going and it’s forcing opposing teams into uncomfortable situations all over the ice. On the whole, San Jose was making the plays they had to make versus making the plays they wanted to make at 5v5, on the PP, and on the PK. Jamie Baker of the Sharks local broadcast crew suggested that the Sharks would prefer a special teams battle; after the second Leafs power play goal, he quickly rescinded the statement. Just too good. All four Leaf lines are fully engaged, checking all over the ice, and feasting on teams when transitioning from defense to offense. Seemingly, wild backhand swats of the puck end up being tape-to-tape passes to a man-in-motion more often than not. If the play is not completed, the puck is put in an area where they can defend it with structure — and numbers — and force another turnover, further breaking apart the opposing team’s defensive structure. That’s how the Leafs are generating so much off the rush and creating so many of their grade-A looks. It’s a big reason why they look as good as they do. Nazem Kadri was being too hard on himself on the bench against San Jose. He’s playing great two-way hockey most nights but has been a bit unlucky in the goals and assists department (tracking for 22g, 25a (47pts). One of the things I’ve noticed with Kadri over the years is that he doesn’t play at his best with “burners”; i.e. extremely fast wingers like Kessel and Kapanen. It’s not to say he plays poorly with them; I just think he likes a game where you can slow it down a notch at times, survey the ice, and create seams by trimming off speed. With both Kessel and Kapanen, they like to play with their foot to the floor. I’m not certain that’s Kadri’s favourite style to play, although he can play it if he has to. Kapanen is still guilty of playing with horse blinders on and going too fast in the wrong directions, and it can make for an abrupt, jerky line on occasion. Connor Brown is best suited to fourth line duty at this point and Josh Leivo has shown he can drive play and keep plays alive as well as anyone on the team. As Anthony noted in his recent notebook, Leivo played on his offwing when he was playing with Kadri there and he’s just not skilled enough to pull that off at the NHL level (few players are). He’s settled into his role on the fourth line and they have been a flat-out dominant unit on some nights. Leivo is a big reason for that, and I would be curious to see how he would fare next to Kadri. Kadri is getting shots off from within the home-plate area and the middle slot, which is hard to get to and hard to get off in time. Of his 22 shots in the past six games, only nine are outside the home-plate area and there have been a bunch right down the middle of the ice. He was unlucky to get another breakaway against San Jose only to hit the post. Kadri looks primed to go on a heater very shortly. Andreas Johnsson was always going to have difficulty following up his hat-trick in the first period inside 12 minutes of his breakout performance versus the Philadelphia Flyers, but he did so by making two critical shot blocks while the Leafs were ahead versus Boston and again against San Jose when he broke his stick blocking a point shot. Slowly but surely, Babcock is turning Johnsson into a skilled checker he can throw over the boards in any situation, building up the player into someone who is useful in all situations. There is way too much talent on this team to think you are going to just skill your way into the lineup. Some might have viewed Babcock as being unduly hard on the player earlier this year, but he’s making him significantly more useful player that can play on any line and in any situation. If you want a shot at playing with JT-Marner or Matthews-Nylander, you have to be all-in over 200 feet of the ice. Johnsson is earning his way there the right way right now. First Dermott, then Kapanen, and now Johnsson: Three players who have been developed under this regime that weren’t three-situation players but are becoming successful contributors and better players because of it. Now that he’s found his health and his confidence, it would be interesting to see if there might be anything of interest in terms of hidden chemistry with either Matthews-Nylander or Tavares-Marner for Tyler Ennis. There were some partial shifts with Matthews/Kapanen, as well as Tavares/Leivo and with Marner later in the game against San Jose. He was unlucky not to have potted a goal or two and seemed almost surprised to get the puck in such prime scoring chances. It doesn’t appear he’ll get the chance anytime soon, though. Babcock wants heavier puck retrievers paired with skilled duos and Ennis doesn’t fit that role, although with three 50pts+ seasons under his belt, he has shown he can play at a high level in a top-six role (albeit on terrible hockey teams). Ennis started the season Matthews wing, but he was playing his offside (right wing) and their play was clumsy because of it. Matthews needs his right winger to be able to whip passes back and forth, and that’s just not possible when he’s feathering passes onto Ennis’ backhand, but Ennis is showing the tenacity along with flashes of skill that made him a fan favourite with the Buffalo Sabres. What more can we say about Travis Dermott, who finally got the monkey off his back with his first goal of the year in Boston? For my money, Dermott is starting to challenge for Jake Gardiner’s title of second best defenseman on the team. He is playing hungry, determined, and confident. The coaching staff is easing him in and making sure he takes no steps backwards, but it’s getting to the point where he needs more minutes to play better while playing less with the fourth line against other fourth lines. It was a nice little reward, that shift with Hyman-Tavares-Marner + Morgan Rielly, and he took full advantage of it. I also wanted to give a nod here to Igor Ozighanov, who on top of the points he’s picked up of late, has executed clean and consistent breakouts for the most part. Right now, he’s bottom-pairing gold with Dermott, who is clearly elevating his game and doing a great job of driving that pairing, but Ozighanov is putting in good performances on a regular basis. Ozhiganov’s game can definitely fall right off and he can look lost for large spells of a game, a shift or parts of shifts, but for his first foray into the NHL, he is looking like he could prove to be the steadier of the two Leafs Russian free agent signings as this season progresses. More than a couple of jokes have gone around about Mike Babcock’s penchant for athletes that take care off all the off-ice duties like professionals. But you only have to look at the examples of the failing rebuilds around the league that haven’t sought out “gud pros” who can play at a high level. Hello, Edmonton. Hello, Buffalo. Hello, Arizona. It’s not a coincidence that there have been no off-ice controversies, that the team is healthy and performing well, and that it could be fairly argued no single player young has taken a step backward. The Leafs are slowly turning into a Detroit/New Jersey/Tampa hybrid — a machine that churns out 200-foot players and has year-to-year momentum. Patrick Marleau is affecting each and every player on and off the ice. They watch how he carries himself, how he trains, how he prepares himself, how he eats. The list goes on. Here was Morgan Rielly on the Spittin’ Chiclets podcast earlier this year. When you’re wondering how Rielly, Matthews, Marner, Nylander et al are keeping their nose clean and their bodies in such great shape ten years from now, you can probably look back to the Marleau signing and how it provided examples of the attention to detail it takes to play nine seasons in a row at the highest level without missing a single game (and 1,601 in total). For a rebuilding team that was barren of any stars for the young players in the organization to mentor under (and one that had various off-ice issues with discipline and partying), Marleau may be an overpaid player for his on-ice results but the impact on the organization as a whole is remarkable. Marleau scored 27 goals last year, which was third on the team, and he led the team in scoring during the playoffs with four goals in seven games. He’s currently on pace for 20 goals and 47 points, which will probably creep up as the season goes on. In the month of November, he has five goals and five assists in 14 games — a 30 goal, 30 assist pace over a full season, AKA first line production. He’s roughly a 50% possession player over that time. The demise of Patrick Marleau has been greatly exaggerated. Players that are this good for this long get a longer runway to work their way into the season than others. He’s not what he once was, but he’s still a helluva lot better than he was getting credit for earlier in the season. Auston Matthews is third in the league in points per game (1.58 ppg) behind Nathan MacKinnon (1.64) and Mikko Rantanen (1.68). Mitch Marner is fifth.